The term snake extermination isn't really a fair term. Snakes aren't like insect pests, and they aren't really exterminated. An exterminator is someone who kills something, typically insect pests, often through the use of poison sprays. Snakes are not dealt with in this manner. You wouldn't call an insect killing extermination company to take care of a snake problem. If you need snake taken off of your property because they are causing snake damage, you need a professional wildlife trapper to solve the issue. This is a photo of a snake caught by hand. It will be physically removed from the home it was caught at. This will stop the problems that the animal was causing on the property, which are usually admittedly small. Many people are simply ignorant and afraid when it comes to snakes. If you have a snake phobia and you simply must have snakes exterminated, please don't think of killing them. Have a trapper come and catch the snake and safely relocate it to a different habitat. Wildlife management and control is different from extermination, so if you want a pro to come and take care of your snake situation, call one of the experts listed. Snake extermination products - Snake extermination is usually unnecessary. There are the rare occasions where homes are overrun by hordes of serpents searching for their hibernation den. The normal situation involves a few snakes that have gathered in a poorly-kept yard or overgrown yard. Yes, the way homeowners maintain their property can be the direct cause of snakes in the yard. It will not take long before creatures start invading un-mowed grass. Not only does lengthy grass hold in moisture and breed insects, longer vegetation will conceal snakes from possible predators. The grass keeps them cool in the hot summer sun, and allows them to move through the yard, stalking prey. Un-mowed grass is one of the most common problems around homes that have snake issues. Similarly, if you have mowed grass but a hundred little piles of leaves, sticks, garbage, or refuse around the property, snakes will see this as the ideal place to create a den. Gardens can serve a similar purpose. You may not be a packrat, but you may have multiple gardens with dense growth or weeds. A snake will take any opportunity to conceal itself. If you still get rid of the snakes around your home, consider a glue trap and not a lethal trap. Can an exterminator remove a snake from house - Before you, or a licensed exterminator, attempts to remove a snake from the house you must identify the animal as venomous or nonvenomous. 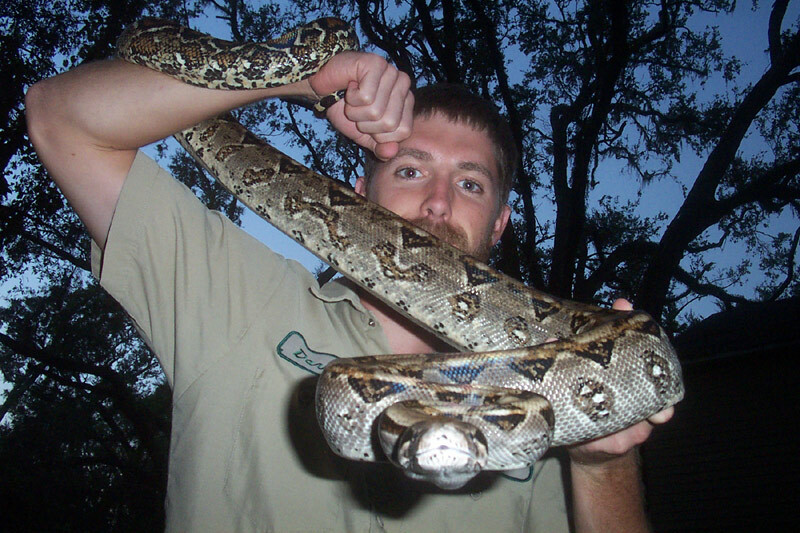 If the animal is a pit viper or a coral snake, you need to call a snake removal professional. When people are bitten it is almost always because they are trying to pick up or kill a snake. Just because it is poisonous does not mean you should attempt to pick it up or kill it. Once the snake feels threatened it can strike at any moment. The reach of a garden tool or bat is well within strike-range of the snake. A nonvenomous snake can be handled with gloves if you are not alarmed by the wiggling of a snake in your hands. Most people are not willing to get this personal with a legless reptile. If you have something with a hook on the end, you can use that to scoop the snake into a pillowcase. Avoid attempting to kill the snake even if it might seem like an easy target. Any snake that is threatened will bite. Just because it is not dangerous doesn?t mean it can?t bite and cause some serious damage. Puncture wounds are prone to infection because the holes seal over relatively quickly.